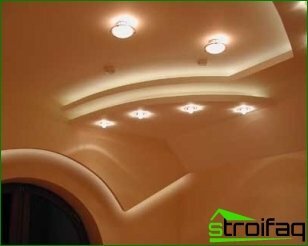 Light is able to revive even the most boring interiorand make room to play more and more new colors. Light - it is an affordable tool that allows you to give your apartment and comfort. 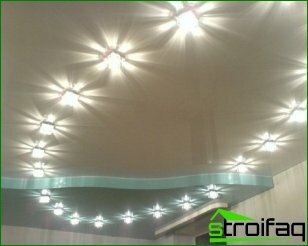 Therefore, the choice of lighting should be approached with the utmost responsibility and care. 1. You should always pay attention to the size of the room. In order to become a large room visually smaller and cozier, better lighting installed so that their light fell on the wall. The small room is better positioned closer to the ceiling light fixtures. This will maximize the space and make it more spacious. 2. Be aware of the magic rule. 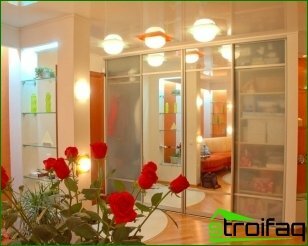 The more light, the more comfortable and cozy is located in the room. Make your room maximum illumination. Your apartment - a place where you are engaged in a variety of all sorts of things. Clean, cook food, play with children, rest and work. Try over work surfaces have a maximum power lighting. As for the children's room, there will need to install multiple, different functions and power lamps. The child learns lessons - give him as much as possible light, goes to sleep - leave it on a soft and muffled source. 3. This rule also applies to those places in your home where you spend most of your time. Many are ready - install lighting high power appliances in the kitchen, or rather, above the work surface. 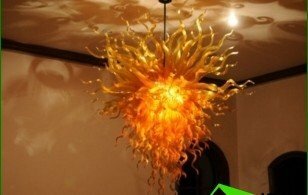 For example, the use of chandeliers with shades. 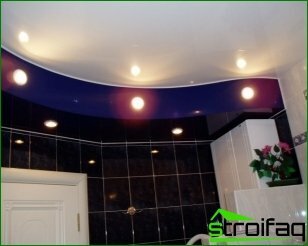 I love to show off in front of a mirror - Mount the right over it optional ceiling light source. 4. Favorite vacation spot you can beat the color-changing lighting. To do this, use the light sources with color shades. Only it should be done with caution. Color is very strong effect on the psychological state of a person. Plafonds green will help to relax, calm down and focus on something important and essential. The recreation area, try to avoid red. He is able to escalate the situation, cause uncontrollable bouts of irritability and create an oppressive atmosphere, which does not correspond to peace. When using colored lampshades should not forget that they change colors surrounding interior. Particularly strong influence on the color of objects from the ceiling light blue. But blue is not particularly suitable for recreational areas. Most of all, it is appropriate in the bathroom, where gladly emphasize white tile and sinks. 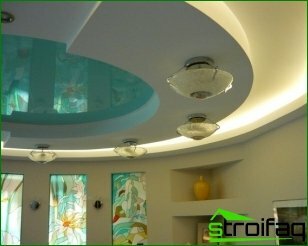 When choosing colors for the ceiling should also focus on your family and friends. Everyone surely has its own color preferences. 5. Caution should be used for ceiling lights. 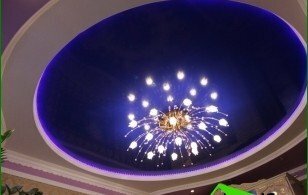 Of course, crystal chandeliers - it is beautiful, and the more devices installed on the ceiling, the brighter the room becomes. But it is very much obscured by the ceiling itself, because the light from these devices is directed only downward. In conclusion, I want to say that if youOnce again, pull-stick wallpaper, move the furniture or paint the ceiling, try reinstalling the lighting in the apartment. Suddenly it would be a means capable of effectively and quickly change your view of your favorite house. Enjoy your change!